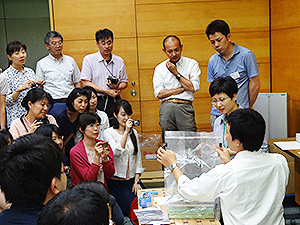 Training for Museum Curators in Charge of Conservation has been conducted annually by the National Research Institute for Cultural Properties, Tokyo since 1984. The training is intended to teach a basic knowledge of conservation and conservation skills to individuals who are in charge of conserving cultural materials in museum. This year, the training was scheduled from 2 weeks starting on July 14, and the trainees were 31 curators in charge of conservation and administrators of cultural properties from throughout Japan. During the 2 weeks, trainees learn about key conditions for conservation, such as temperature and humidity, climate control, and pest control, as well as causes of and steps to deal with degradation of different types of cultural materials by experts from the Institute and other institutions. The current training session also included lectures on dealing with water damage and radiological contamination of cultural properties in the event of a disaster. Trainees also practiced the techniques they were taught by those experts. Thanks to the Kiyose Historical Museum, trainees were able to experience a study of the conditions at a museum first-hand in a “case study” of the museum. Trainees divided into groups of 8 and studied specific topics, and they subsequently presented their findings. Most of the trainees have extensive practical experience and they are aware of institutional and facility issues for conservation. This training emphasizes materials conservation from an academic standpoint. Many trainees are flustered by the gap between ideal conservation and the realities of that work, so they ask numerous questions and often solicit advice during every lecture. The intent is to have trainees recognize that gap between the ideal and reality and to think about what steps they should take, given that reality, to conserve materials. Conservation is, after all, the primary mission of a museum. Institute personnel seek to maintain close ties with trainees even after the training is finished and offer them advice and suggestions. Announcement of and applications for the training are usually handled by a relevant department of the Board of Education of each prefecture. Plans are to send out notifications about the next training session starting in February 2015. 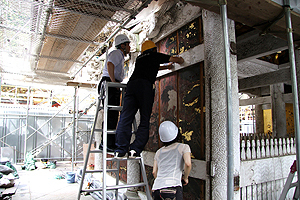 As part of the Study of Traditional Techniques and Materials Used in Cultural Properties, the Center for Conservation Science and Restoration Techniques is currently conducting a study in line with restoration of the paint pigments on the Yomeimon Gate of the Toshogu Shrine. Large Panels with a Relief Sculpture of a Peony Design that were created in 1796 are currently installed on panels on the east and west walls of the Yomeimon Gate. According to historical documents, however, the walls had contained paintings produced by a technique known as “tung oil sprinkled with Makie” in much earlier years, such as 1688 and 1753. During restoration of these Panels in 1971, the east wall was removed, revealing a painting of 3 Zebra Finches Perching atop a Japanese Plum Tree on a Crag with Bamboo Grass that is thought to have been produced in 1753. The painting was studied by the Department of Conservation Science at the time. In addition, X-ray imaging at the time also revealed a painting of Nesting Cranes in a Pine Tree atop a Crag with Bamboo Grass beneath the panels on the western wall. However, the wall panel overlaying it was not removed, so the actual painting was not visible. The current study removed the overlaying panel on the western wall in order to restore its paint. Its removal revealed the painting beneath for the first time in 218 years or so. However, the painting had deteriorated markedly, as was evident from its discoloration and peeling. Thus, the Center examined the painting’s materials and its deterioration in cooperation with the Nikko Toshogu Shrine and the Association for the Preservation of the Nikko World Heritage Site Shrines and Temples in order to prevent further deterioration. In addition, X-ray imaging was done so that researchers in the history of painting could verify that traces of paintings from earlier periods were beneath the painting (Photos 1 & 2). 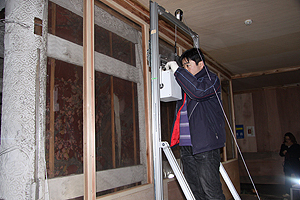 Results of this study will help to reveal the state of paint pigments that have adorned the Yomeimon Gate since the Nikko Toshogu Shrine was completed in 1636. Results will also help to maintain the works in somewhat better condition. Training for Museum and Art Museum Conservators was conducted for 2 weeks starting on July 8th and was attended by 30 curators and administrators from around the country. Training focused on gaining the basic knowledge and learning methodologies needed to conserve materials through lectures and practice. The curriculum consisted of 2 areas: (1) management of materials and conservation conditions grounded in basic natural sciences and (2) causes of the degradation of different types of cultural properties and steps to prevent that degradation. “Case studies” that involved putting conservation conditions into effect in actual settings took place at the Shinjuku Historical Museum. Participants divided into 8 groups and conducted field studies and assessments of aspects such as temperature and humidity ranges, the effects of outside light, and pest control in galleries and repositories. The following day, they reported their results. 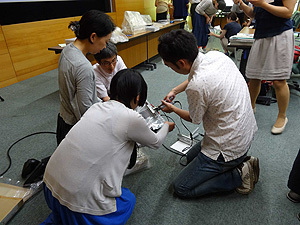 During the training session, a group discussion of the issue of reduced energy use at facilities handling cultural properties took place with the help of the Conservation Division of the Tokyo National Museum. This session marks the 30th training session since training began in 1984. In total, over 700 individuals have attended the training. Individuals who underwent training early on and who have been at the forefront of materials conservation are beginning to give way to the next generation. As future generations carry on this conservation work, the Institute will determine what form this training should take in the future while remaining cognizant of the role the Institute needs to play in materials conservation.